Over the past couple of years I have been working on renovating my house. It’s slow progress due to my health and funds. I’m slowly progressing through the house with the bathroom needing a second lot of grout, all bedrooms just needing little things fitting like new curtains and carpets. I’ve purchased the curtains for all of the rooms but it’s just finding the energy and time to complete. The hall, stairs and landing walls have been painted and I need to paint all the doors and fit new door handles, then carpet and new wooden floor for the hall which will be the last thing I don in the house as I don’t want it getting damaged while renovations are being done in the rest of the house. That just leaves the kitchen (I’ve painted the cupboard doors and need walls, flooring and new work tops and hob, oven and sink), the utility and down stairs toilet (yet to start) and the lounge/diner which I haven’t decided yet whether I will put back in to 2 rooms as it’s currently 32ft long and rather a large room that doesn’t work well as a lounge/diner if I’m honest. My huge chimney breast was decorated a couple of years ago and I just need to brighten up the paintwork and again new carpet and curtains. A couple of weeks ago I, along with a friend (ok they did most of it) stripped the old wallpaper off my office walls. Originally my house had a double garage but 30 odd years ago one of the garages was converted in to a room which I now use as my office. Working from home I find it essentail to have a separate space where I can go and work from and find I am far more productive when working this way than when I take my laptop and sit in front of the tv. 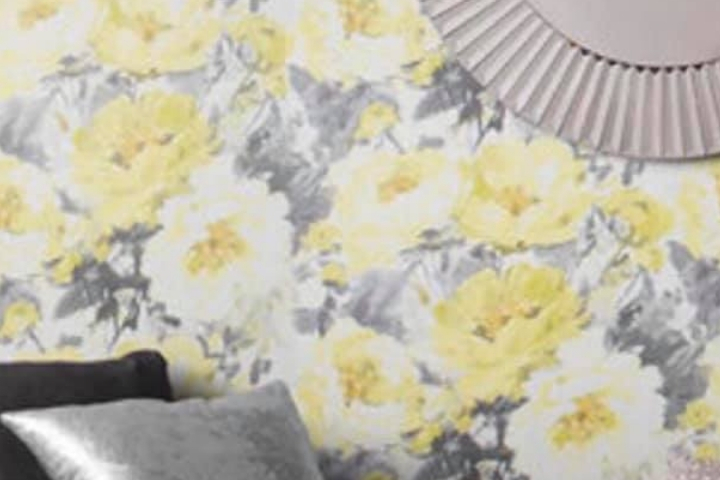 My favourite colour has always been yellow and although my bathroom is a nice sunshine yellow I went on the hunt for yellow wallpaper for one wall which will be patched with a light grey paint for the other three walls of my office. The carpets throughout the house are a dark grey as can be seen here and all the rooms have a touch of grey in them along with another colour or two as an accent. Although it will be mainly an office the room, being a converted garage is large enough for a desk and shelves plus a sofa up the far end of the room. I hoping the room will be a quite space for me to relax too. 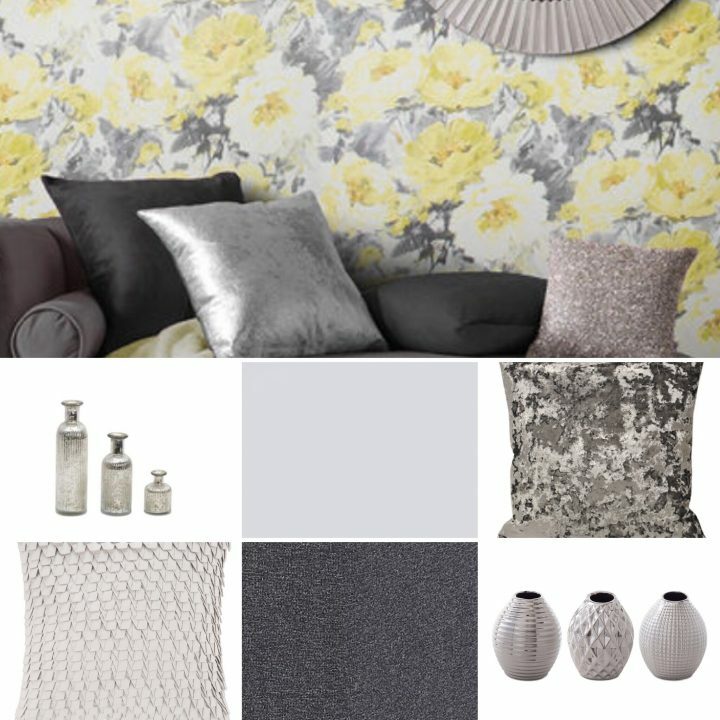 I have seen a nice modular sofa in dark grey which will be a nice contrast with the wallpaper I’ve chosen. Whilst I’ve got the curtains, carpet, sofa, paint and wallpaper sorted for the office that just leaves me with the important items; a desk and shelving and accesories which I would like to be silver coloured. As the wallpaper has some white in it and all my other furniture seems to be beaked/oak I wanted some white painted furniture in order to give a fresh ping to the room. I have found some lovely furniture at Lionshome as well as some nice silver accesories for my office. I may have seen a few accessories that would look good in the hall and my bedroom too! I really like this white painted desk with the drawers as I would certainly make use of the storage of work bits and bobs. The desk is a nice size to put my desktop on as well as a few pencil pots, notebooks and a lamp; you can never have too many notebooks, pens and pencils and the odd cat too as I always have one or two of them by me when I’m working! Talking about cats, I think they would love this shelving unit to climb. When you blog for a living you tend to collect lots of little nic nacs and props that yoou use for photography purposes. This set of shelves would be lovely to store trinkets on and could also be used for lifestyle photographs when I need to photograph an item for review purposes. The larger shelves at the bottom would be ideal for a couple of baskets to put camera equipment it as well as smaller photography props I have plus the odd cat! 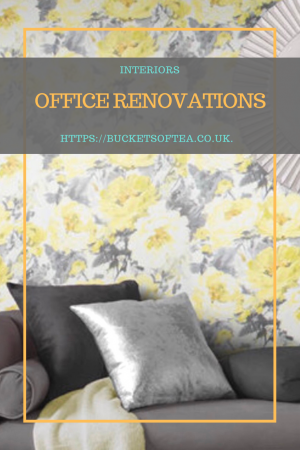 Now I’ve done my planning of my office renovatiuon and put together my mood board I just need to start the actual work now! Are you carrying out any renovations at home right now? 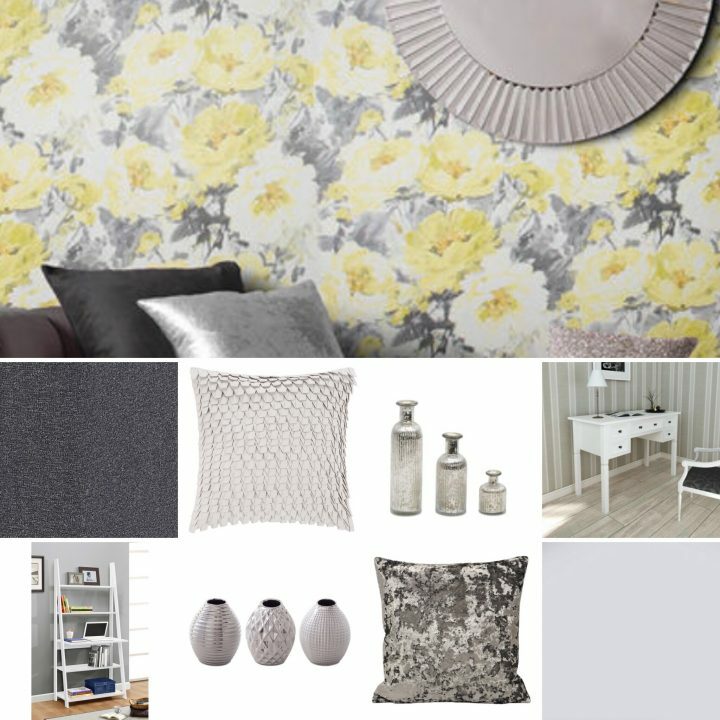 Do you make a mood board to design what you would like before starting the project? I love the palette you have chosen. It is so serene and pretty. Having your own office space must be great. 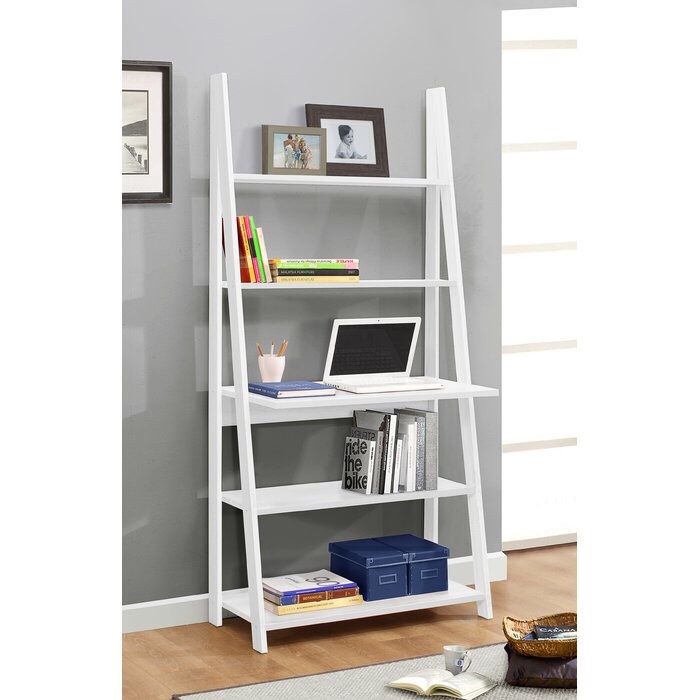 I do really like that ladder type of shelving – it looks so cool. The whole color palette here is awesome. Adorable! I’m about to move and love the inspiration for my office.